Maybe you are considering enrolling your child into an after-school program, but the question then becomes, “Which one?” And that is a completely valid question. With so many different options at your disposal, it can be confusing to understand and choose just the right one for your child. Would after-school tutoring be a better choice, or should you choose after-school enrichment? What’s the difference? 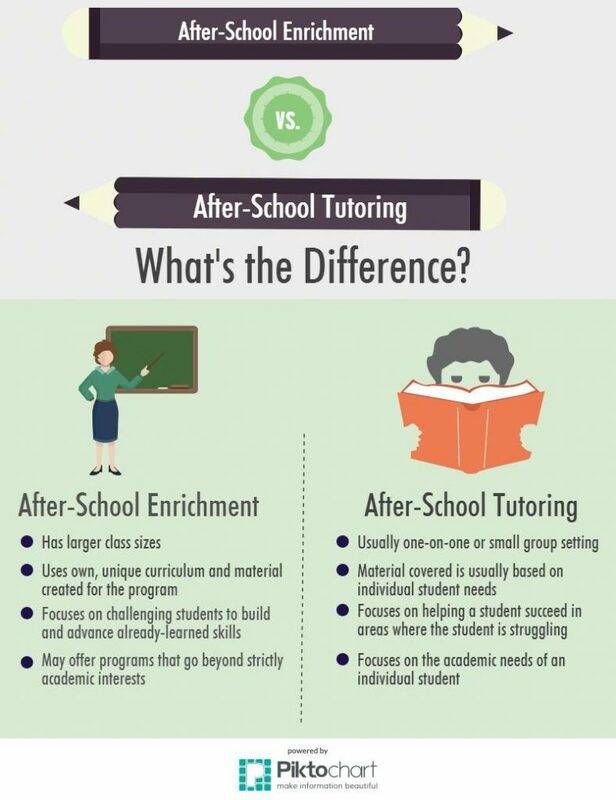 As you can see, the differences between an after-school enrichment program and after-school tutoring are many. Which choice is best for your child? If your child needs focus on a certain area of school, or is beginning to struggle, after-school tutoring might be the best fit for your family. However, if your child is advancing quickly in school, would like an extra challenge, and does well in an engaging group setting, you might want to check your area for an after-school enrichment program. No matter what your child’s needs are, there is certainly a program for you, and hopefully armed with these facts, you can get a head start in giving your child his best chance for success. What do you think? Are either of these options something you would be interested in for your child? Have you found success with either an after-school tutor or an after-school enrichment program? Let us know in the comments! Author: Emily Karth, MathWizard, Inc.